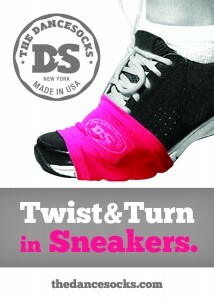 You are here: Home / Reviews / Fashion / Dance Socks Review: Turn Sneakers into Stylish Dance Shoes! Dance Socks Review: Turn Sneakers into Stylish Dance Shoes! Are you someone who loves to dance? While I am not a big dancer myself, my mother is and I saw her throughout the years spend a small fortune on shoes. She loved ballroom dancing and just about every type of dancing out there. For me, the closest I ever came to dancing was dance aerobics. I didn't stick with it long though since the gym I was taking classes at required everyone to buy expensive, $150 shoes. Being a college student at the time, I didn't have that type of money but very quickly got my money back for that class. For me, it was a major disappointment. So, why do they require expensive dance shoes? To protect the floor and make it easier for you slide doing certain dance moves. While I understood why they do it, it just wasn't something I could do, at least until now. I recently discovered a new company that makes special socks for sneakers, turning everyday sneakers into dance shoes. So, what is this product called? Dance Socks (cute, huh?)! When I found out they were made in the United States, I was even more curious and wanted to learn more! Lucky for me, Coco's Closet allowed me to review these spiffy "socks" for free. So, what did I think of these cute dance socks? Check out my review below to find out! Want to try out Dance Socks? They can currently be purchased at Coco's Closet for $10 (you get two pairs per pack). This is fairly inexpensive and perfect for anyone who is dancing or taking Zumba classes. To learn more about these spiffy dancing socks, make sure to check out the Dance Socks product page at Coco's Closet. Also, don't forget to like them on Facebook to see some of their latest finds! Never heard of Coco's Closet? They are a new, chic curating site that is designed to introduce women to the coolest fashions and accessories from all over the world. All of their products are designed for busy, independent women who only want the very best. Not only do they carry products made for women like you and me, but some of the coolest gifts from all over the internet. Best of all, Coco's Closet considers it their mission to bring you stylish gifts and accessories that are eco-friendly and perfect for busy women who are constantly on the go! Check out their site and see why Coco's Closet can easily become your new best friend today! Disclosure: Budget Earth did not receive compensation for this review but did receive free products for review purposes via Tomoson.com . All opinions on this product are my own and may differ from our readers' opinions. very neat! what a simple product that actually works! Awesome! Very flexible for those last minute twirls that come upon you. well thats a pretty cool idea. Neat idea! Wish I had known this before!! Awesome idea! Now we call pretend to be Tom Cruise in "Risky Business" without ruining our socks! I have never seen anything like these before, I like the idea. Love it!!! I bet a lot of dancers are jumping and dancing about these! What a great idea! I will have to try them! Me & my son love to learn new dances and the sticky sneakers have always been an issue! A very simple idea that I can see taking off. Lots of people are into moving/exercising, and dancing is a great way to do that and have fun. I tripped on the carpet at my gym during a dance aerobics class.I am sure it was because of the traction on my Reeboks.I broke my tailbone when I fell. I think these Dance Socks would help me.They're cute too! I think it is such a cool idea. Wow! This is an awesome product! I danced for years when I was a kid and this would have saved my mom a lot of money on dance shoes. Very efficiently written post. It will be supportive to everyone who utilizes it, including yours truly :). Keep up the good work – i will definitely read more posts….